Looking for a break away from the hectic city life in Ahmedabad to a hill station? Well, if you do not desire to go far away from the boundaries of Gujarat, then Mt Abu is the perfect destination for you this season. Located in the Aravalli Range in the Sirohi district of Rajasthan, Mt Abu is the only hill station in the state of Rajasthan and is immensely popular amongst tourists for its cool atmosphere and unpolluted environment. From lakes to hilltops and temples to gardens, there is a lot to relish in Mt Abu. Also known as the Shimla of Rajasthan, Mt Abu is a definite place to enjoy the beauty of an oasis in the desert state of Rajasthan. So, how about a trip from Ahmedabad to Mt Abu to experience the fresh beauty of nature? Being a hill station, the region in and around Mt Abu experiences a cool climate. Therefore, it is a year-round destination. However, if you want to savour the beauty and charm of this small hill station at its best, then the best time to visit Mt Abu is from August until the end of April. By Air: You can take a flight to Udaipur airport, which is located a distance of 210 km from Mt Abu, and from there you can either catch a bus or hire a cab to Mt Abu. By Rail: The nearest railhead is Abu Road railway station which is at a distance of 28 km from Mt Abu. From the railway station, you can get a cab to Mt Abu. By Road: Located at a distance of 250 km, Mt Abu is well connected by road from Ahmedabad and other cities; hence, it is easily accessible by road. However, route 1 is preferable as takes half an hour lesser in comparison to route 2 to reach Mt Abu from Ahmedabad. How about visiting some historical monuments before you get lost in the ecstasy of a natural environment? If you love exploring places, then you must put Mehsana on the list of en route destinations. Flourishing since the time of the Chavda dynasty, Mehsana has been ruled by the Chavdas, the Gaekwads and later, the British. Today, it is popular for its historical spots, such as Rajmahal, which dates back to 1904, and Bother Kotha Ni Vav, a stepwell dating back to the 18th century. Looking To Learn About The Majestic Forts Of Gujarat? Palanpur should be your next stoppage while on your way to Mt Abu if you want to learn about the history of Gujarat. Ruled by the Chauhans, the Jhalori dynasty and the British, Palanpur is known for its ancient temples, gates and stepwells. The major tourist attractions in Palanpur include Mithi Vav, Mira Gate, Kirti Stambh and several other temples dedicated to Hinduism and Jainism. Eventually, after travelling a distance of around 250 km, you will reach your destination. There are innumerable things to do and places to visit amidst the beauty of Mt Abu. From enjoying its scenic beauty to visiting historical monuments, Mt Abu offers its visitors a lot to explore. Following are the major places in Mt Abu which remain tourist attractions throughout the year. How about exploring the richness of Indian history amidst the colourful and vibrant lives of Mt Abu? If you desire to learn a little bit about the history and background of the town, you can visit Dilwara Temples, which will certainly be revered by every historian and history lover. There are Jain temples which date back to the era of the 11th century and are dedicated to different Tirthankaras of Jainism. The architectural beauty of the Dilwara Temples is the reason behind its popularity and fame amongst tourists and travellers. The major temples which form the cluster of Dilwara Temples include Vimal Vasahi, Luna Vasahi, Pithalhar, Mahavir Swami and Parshvanath. Located in the Aravalli Range, Mount Abu Wildlife Sanctuary is another major tourist spot and is home to several rare species of plants and animals. From sub-tropical thorn forests to evergreen forests and wild roses to bamboo forests, it nurtures everything. Apart from rich vegetation, you can also spot numerous rare and endangered species of animals such as sloth bear, jungle cat, Indian fox, golden jackal, etc. If you love photography and sitting under the shades of rich forests, then do visit Mount Abu Wildlife Sanctuary. 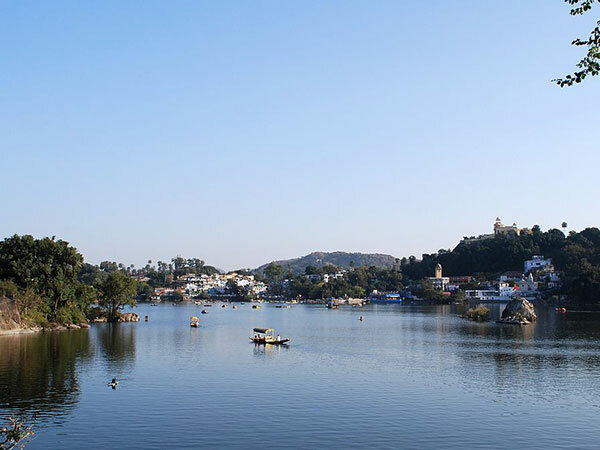 One of the most visited places in Mt Abu is its beautiful and sparkling Nakki Lake which is always surrounded by hundreds of people throughout the day. On account of its peaceful ambience and stainless environment, it attracts each and every traveller coming to savour the beauty of Mt Abu. In Hinduism, Nakki Lake is considered a sacred spot because of the several legends and stories related to its formation by the Hindu gods. The spectacular view of the lake at the time of dusk is something which should not be missed. Apart from natural beauty, it also offers its visitors with water activities, such as boating, fishing, etc.